S​​ince having won ​The Irish Heritage Music Award​, following a lauded performance at London’s Wigmore Hall, Adam Heron has established himself as one of today’s leading young pianists. He frequently performs as a recitalist, concerto soloist, and chamber musician both in the UK and abroad. Overseas engagements include a concert at the Residence of the ​British​ ​Ambassador​ ​in​ ​Kiev,​ ​Ukraine,​ ​a recital tour of his native Hong​ ​Kong​ ​with​ ​the​ ​acclaimed​ cellist​ ​Jamie Walton, and further concerts in Ireland, Spain, France, and Morocco. Within the UK, he has performed​ ​at​ ​venues including the Royal Albert Hall, and has given recitals at many high-profile music festivals, such as The Ryedale Festival, The Cheltenham Music Festival, and The Carducci Festival. 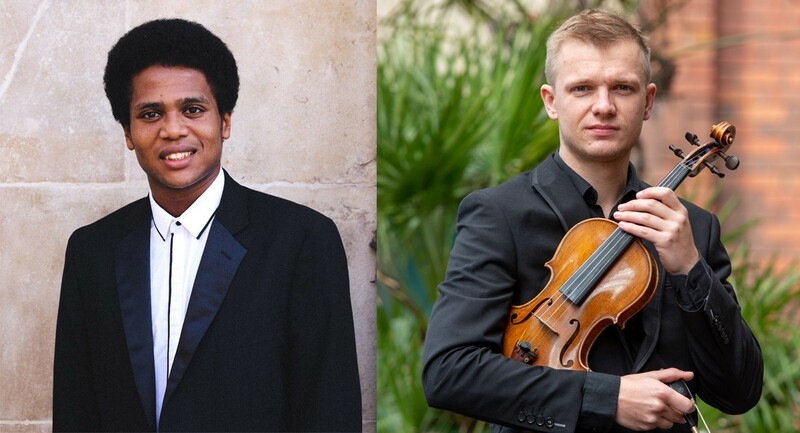 He was invited to return to The Cheltenham Music Festival in 2017 for a concerto performance with the renowned Chineke! Orchestra, which was founded by Chi-chi Nwanoku OBE. Further concerto collaborations include performances alongside David Curtis, Glyn Oxley, and the American conductor Jonathon Heyward. Violinist Christopher Quaid has performed extensively with the RTÉ National Symphony Orchestra of Ireland and RTÉ Concert Orchestra under the batons of internationally renowned conductors such as Nicholas Collon, Daniel Cohen, Courtney Lewis and Andrew Gourlay.​ ​Recent performances with the RCM Symphony and Philharmonic Orchestras have seen him work with Bernard Haitink, violinist and conductor Thomas Zhetmair, members of the Chamber Orchestra of Europe and Jack van Steen. He has also performed with Camerata Ireland and alongside members of the Irish Chamber Orchestra. May 2017 saw him participate in the Chipping Campden Festival Academy Orchestra and perform alongside Paul Lewis, Roderick Williams and Nicola Benedetti. In November 2016, Christopher was awarded the prestigious Irish Heritage Bursary which assists his studies in London and will aid the development of his professional career.